Pueblo Revolt Summary and Definition: The Pueblo Revolt was a short conflict which occurred during 1680. The Pueblo Revolt was located in New Mexico and Arizona between the Pueblo Alliance and the Spanish. 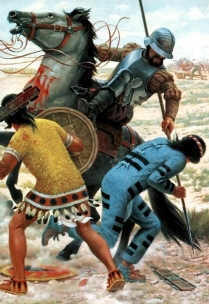 The Pueblo Revolt of 1680 was instigated by a coalition of tribal leaders, acting under the direction of Popé, a Tewa Indian from San Juan Pueblo. Together they founded the Pueblo Alliance consisting of Jemez, Keresan Pueblos, Piro Pueblos, Tewa Pueblos, Tiwa Pueblos, Zuni, and Hopi peoples. The Pueblo Revolt was a great victory for the Pueblo but the Spanish eventually re-conquered the lands in 1692. 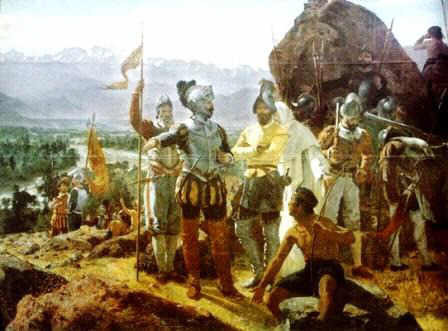 1675 The Spanish continue with their vigorous efforts to replace the rituals of the Indians with those of Christianity. Governor Juan Trevino ordered the arrest, imprisonment and corporal punishment of 47 medicine men following accusations that they "bewitched" a local friar. Three of the Medicine Men were hanged and one committed suicide. 1675 To gain the release of 70 warriors take Governor Juan Trevino hostage and threaten to revolt. The Governor releases the remaining prisoners. Discover the key years, famous people and events of the Pueblo Revolt together with the causes and effects of the war, conflict and battle. The illustrated text provides a really useful educational resource for kids and children of all ages. We have included pictures and videos to accompany the main topic of this section - The Pueblo Revolt. The videos enable fast access to the images, paintings and pictures together with the information and the many facts featured on this subject of the Pueblo Revolt.